Elaine Hancock (Olney, United States) on 17 May 2017 in Landscape & Rural. This barn was sitting down the hill from the house. The house was boarded up, but the barn looks like it still could be used. Like a sweet little house wearing a hat !!!!! !Lovely image !!!! Regarding that plant Elaine..the owner of the plant is travelling..once she comes back I shall get the name. . . well, the windows suggest it might be lived in ! Une très belle grange ! You capture this barn just right. Being new to living in the US, I think these old barns remind me of watching western movies always with these types of barn's in them. Excellent image. 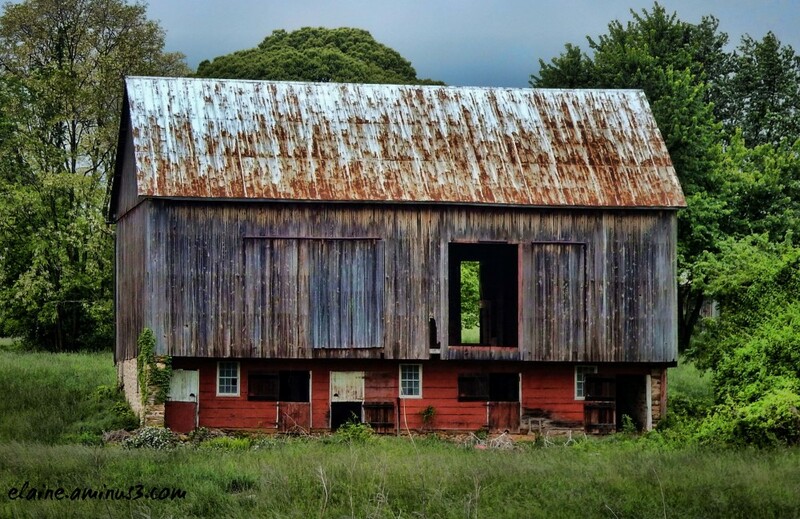 @Shaun: This bank barn is one of the most prevalent types of barns found in Maryland. I have seen barns worse than this in use. Nice find. Ce fond rouge et ces ouverture quelle cabane et maison sueprbe. Beautiful shot of the interesting old barn. Awesome textures spotted in this well-weathered barn!! It looks like it's floating in the air. It looks so authentic I want to reach out and touch it.